For the past four years in a row, my Man and I have been ringing in our “anniversary” at Po. No we’re not married (yet! ), but we are staunch sentimentalists and love celebrating the anniversary of our first date, and if you must know, our very first kiss, which we shared over dim candlelight and a large order of French fries and toffee bread pudding, compliments of Schiller’s Liquor Bar. Kimberly was there too (acting as my preferred wing-woman). The date was 11.11.05. 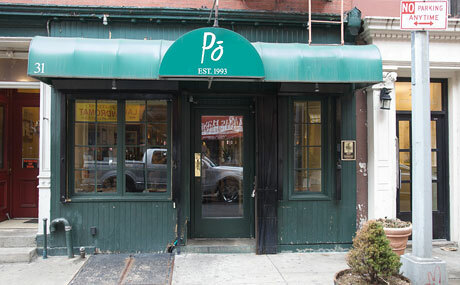 The following year, in search of the ideal romantic spot to commemorate that wonderfully dizzy evening, we stumbled across Po, a true gem of an Italian bistro in the heart of the West Village. Five years later, we still go out of our way to eat there on 11.11 every year without fail. In the weeks leading up to my favorite date, I dream about the five-course tasting menu, beginning with Chef Lee McGrath’s spectacular white bean bruschetta and fresh-baked bread dipped in the most sublime olive oil these lips have ever tasted. I find myself salivating over the pumpkin stuffed tortolloni drenched in brown butter (an inspiration for Chef Belle’s ravioli recipe) and the perfectly smooth yet spicy Amarone della Valpolicella poured and paired to order. Since 11.11 always falls in the middle of autumn, my guy and I have come to expect a very recognizable tasting menu year after year. We start with an amuse bouche that leaves our mouths eager for more, and just then (perfectly timed), our salads are served. Though the salads are the one course that tends to change from year to year, whether the dish boasts beets or endive, figs or pear, the produce is always seasonal and seasoned to perfection. After salad comes the first of two pasta courses, and then the Italian in me really begins to get excited. The pumpkin tortolloni is always our favorite, though I certainly can’t forget to give a shout-out to the beefy and hearty gnocchi bolognese. Forget feeling full at that point, because the main course it just about to be served: succulent guinea hen with a sweet scallion and orzo hash. Once we’ve had our fill of savory bites, the seasoned waiter (almost always the same kindly gent from the previous year!) brings two different desserts for us to taste: one dark, rich and chocolate, the other a lighter, fluffier panna cotta type dish. And as we finish off the last of our well-balanced bottle of red, we settle in to enjoy the cheese course, served as the very last dish, in true Italian style. 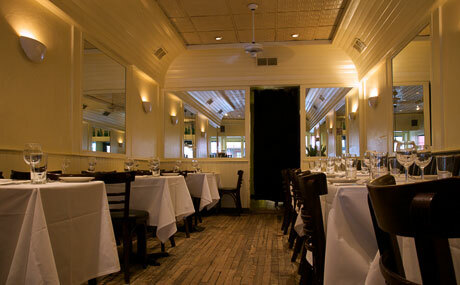 You see, aside from the ambiance, impeccable service, and more than reasonable price points ($52/pp for a five course Chef’s tasting menu! )…the beauty of Po, to me, is it’s familiarity. While I like to consider myself adventurous in some walks of life, I am also very much a creature of habit. Familiar tastes offer me comfort and are washed down with a heavy dose of nostalgia, as I am literally transported to the last time I tasted that very same dish. Every time I bite into that hen, buttery, moist and cooked to perfection, I think back to our first anniversary, and how new and wonderful a discovery it was. It’s kind of like my relationship. As exciting, fresh and unexpected as that first “taste” seemed some four years ago, nothing can beat the flavor of something familiar that has beautifully marinated over time; the taste of something I have truly come to fall in love with.